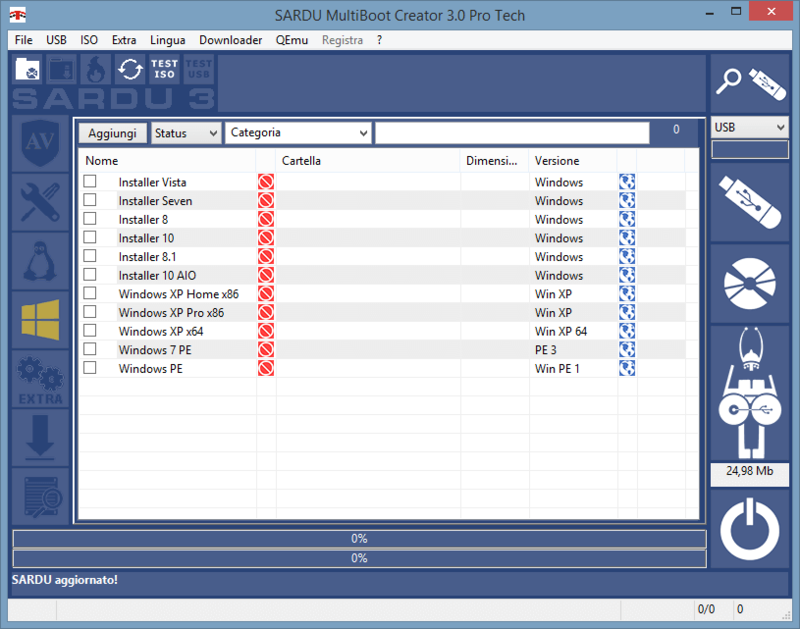 SARDU creates one USB or DVD that enables you to install all Windows from USB or DVD. Can manage the installer of Windows XP, Windows Vista, Windows Seven, Windows Eight and make one pendrive USB with a handy menu multiboot. This is best choice for save time and install Windows in a PC or netbook without DVD player from USB. In the same media you can have all Windows XP (all Sp), all Windows Vista and Windows Seven and Windows Eight (version AIO). One USB or DVD multiboot with all installers of Windows! How to install from usb Windows Eight and more: Here you can find a simple step by step guide. SARDU manages only image of Windows XP not customized or nLited. If the user doesn't have the ISO of installed can generate them it using the practical tool lcisocreator. You can install from USB Windows XP, install Windows Vista, Install Windows Seven and Windows Eight quickly and with a single click without any knowledge of multiboot and without make partitions. Windows Preinstallation Environment (aka Windows PE, WinPE) is a lightweight bootable version of Windows Live. This can also be used as the base of run analysis tools without mounting any available disks and thus changing state. Using external tools as UBCD4win, WinBuilder or BartPe provides the ability to create real Windows Live. These WinPe are boot disk with sound support and other multimedia features, contains a large archive of programs targeted for computer repair and administration, can repair windows damaged, for fix error registry, make a scan antivirus, clone or restore images, recover lost data even if the system cannot be booted anymore. Windows PE 1.x are built from Windows XP, Windows Pe 2.x are built from Windows Vista or latest. Windows PE are not downloadable. You must create your copy with your Windows using external tools downloadable from SARDU. 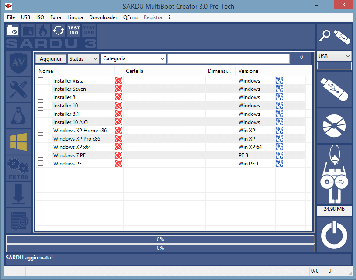 You can use SARDU to install Windows XP Professional, Windows XP Home, Windows 64 Bit (All SP) from the same USB or DVD. User can also have the recovery disk for XP, Vista o Seven or Windows Seven or XP (64bit, Professional or Home)in a practical multiboot menu. Being able to start the PC with windows working perfectly is the best solution to make maintenance.